Grace Lighthouse Fellowship supports missions at home and abroad to spread the gospel of Christ. Chaplain Dave Robbins and the team at Solid Rock Ministries are committed to bringing the light of Jesus Christ to jails and prisons. 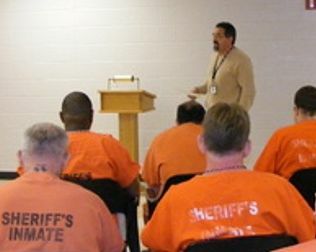 The jail and prison ministry works to change the hearts of inmates; grow them in their faith and teaching them a new way to live by equipping them with choices that will help keep them from repeating the same behaviors that led to their incarceration. An evangelical faith-based mission engaging career and part-time missionary chaplains for Christian ministry in nursing homes and other care facilities with the two thrusts of evangelism and pastoral care. We believe that EVERY life is created by and important to God The Bible is the ultimate authority in all matters of faith and conduct. The Bible was written under the inspiration of the Holy Spirit. In the trinity- the Father, Son and Holy Spirit. That Jesus Christ came to die on the cross so we could be reconciled to God. That trusting in Jesus is the only way to heaven and that He wants a personal relationship with us. The Michigan School of Apologetics (MSOA) is a traveling apologetic seminar to churches. Aaron Wentz is a campus missionary with Reliant serving with Riverview Church at Michigan State University. Besides working full-time as a missionary, Aaron conducts seminars with the Michigan School of Apologetics.